Adam S Comments: So this is what He-Man sees when he’s tripping on acid. Is that small head growing out of the alien’s groin a metaphor? Are those really the people from Walter Scott’s classic novel The Talisman? I mean, I’ve read it, and whilst the two on the right ring a bell I really don’t remember the dude on the left at all. Plus, Leigh Brackett! She wrote The Empire Strikes Back! I bet this is just as good. What doctors with vaccination syringes look like in Michele Bachmann’s imagination. That isn’t a mullet. More like a Prince Valiant with a side part. @RJ, I think there’s supposed to be two of those John Cleese-esque aliens. One of them’s covered up by the thumb on his bum. 🙂 The odd cut and colour of the togas doesn’t help at all. I don’t know . . . the colors are not garish enough to be truly bad. Lime, orange and turquoise are in this fall. Which, now that I think about it, may be why this cover looks strangely familiar, as if I’m looking at a fashion show. 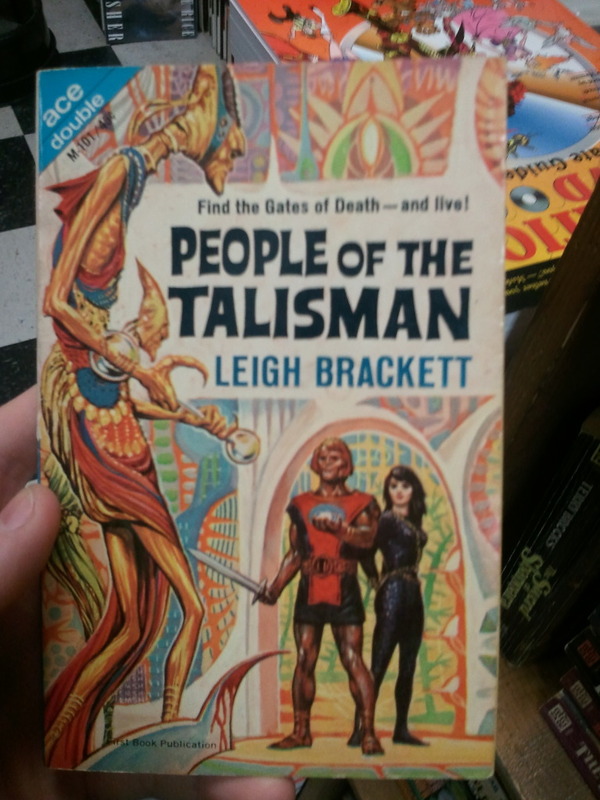 Maybe the talisman is the key look from an extra-terrestrial designer? That would explain both the ultra-thin aliens and the black cat-suit. At least the gal is wearing practical shoes.